This simple four syllable phrase is our 8th Commandment and apparently our St. Louis Cardinals have adhered to this Biblical law since the turn of the century. During this decade the birds on the bat have been virtually paralyzed on the base paths. Today we have better odds of witnessing a triple play than a double steal and that is very unfortunate. You see I grew up in the 80’s when Whitey Herzog’s “Jack Rabbits” scorched the Earth, or at least some Astroturf and manufactured more runs than Chrysler did cars. Now both are a thing of the past. During that era I reveled in witnessing those powder blue jerseys screeching 90 feet, followed by a trail of dust, the players fingers clinging deathly tight to the bag at the end of their blazing journey, as if it were the last life jacket on the Titanic while waiting for an umpire to give them time. I embrace nostalgia. Looking back often allows me a moment to appreciate a time when things seemed pure. When everything was simple. As a child Cardinal baseball was my Bible. Box scores being scripture and Jack Buck being my pastor. Realizing deep into a season, if a player had enough at bats, his average would raise two points with each hit and drop just one with each failure. If only life would be that black and white, that clear cut. That so very fair and simple. So as a chubby young boy whom his parents promised was just “big boned,” I fell in love with the American Pastime. So much so, that I wore a different Cardinal shirt most every day. Tightly against my husky frame, my brilliant red shirts signified my allegiance to the heroes of my youth. During the winter months, being the dork that I was, I often separated two squares of paper towels. Placing one at the very end of my parents long hallway and the other just before the fireplace. They were my bases and I was Willie Dean McGee. #51. I would take my leadoff, wait for the pitcher to get his sign and rumble down the hallway, sliding just before reaching the Brawny paper towel, feet first, striped tube socks almost cutting off circulation, to be called triumphantly safe by ANY umpire other than Don Denkinger! All the while praying for the first signs of Spring. Sad I know, but those were the times of my Utopia. When baseball cards meant more to me than any girl I’d ever known and stealing bases was an art form long before any veins were pumped full of poison, making baseball’s look like Titleist’s and player’s heads like caricatures. During this past decade the St. Louis Cardinals have stolen 817 bases, or ONE LESS than the top three Cardinal stolen base teams of the 80’s. In the pennant Winning year of 1987 the Redbirds swiped 247 bags, in the down year of ‘86 they stole 260 and during the ‘85 campaign they accumulated a ridiculous 311 pilfers, just 30 shy of the modern day record of the 1976 Oakland Athletics! In total that decade of Cardinal teams stole 2,049 bases or 1,232 more than this decade of Cardinal teams. Even throughout the‘90’s the Redbirds remained a threat on the base paths never tallying less than 100 steals except for the Strike effected seasons of ‘94 and ‘95. The most bases stolen during the last ten seasons by a St. Louis club was accomplished by the 2004 World Series participants in which they thieved 113 bags, 23 more than any other St. Louis team of the new millennium. WOW! What a difference an era makes. Granted thievery is down league wide and has always been a cyclical trend ever since Babe Ruth discovered his swing and Ty Cobb despised him for it. Yet I see no reason for abandoning such an efficient strategy for allowing your big bats a better chance. According to the voters we wanted change. Well we got it. The Cardinals of 2007 stole 57 bases as a club, compared to Willie McGee’s 56 in ‘1985 and he was second on the team! 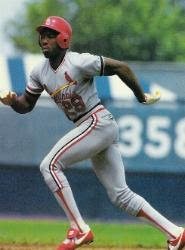 Vince Coleman set a rookie record that season by stealing 110 bases. To put that in perspective the All Time stolen base leader, Rickey Henderson had 11 seasons of more than 57 bases stolen! Considering the fact that this years underachieving team has been shut out more than Glenn Beck at an Al Gore Massage Therapy Class. Should we not manufacture more runs? Is it not better to have a man on second rather than first? A player on third as opposed to second? So when we see Albert Pujols leading our team this year in stolen bases it is comparable to Mickey Mantle leading an AA meeting for the ‘61 Yankees. It just does not make good sense. With runs more difficult to come by then handshakes at a swine flu convention, then make a real change! Turn ‘em loose! Make Colby into Willie, Brendan into Ozzie and let Albert do what he does best. Hit with RISP! Because sometimes you have to reach back to stay a step ahead. Today’s Cardinal team lacks a true leadoff hitter. Imagine if Holliday, Pujols and Ludwick had just one Ozzie, Vince or Willie? Just one! Instead we get to sit idly by as we watch the much maligned manager Tony LaRussa try and pull a rabbit out of his cap each time he fills out a line up card. Crossing fingers and playing hunches that maybe, just maybe he finds the right nine. The one through nine that can finally put up some consistent crooked numbers without breaking the 10th Commandment. Thou Shalt Not Covet Thy Neighbors Goods. And why should we? The Cubs have not won a World Series since 1908! The Redbirds definitely need to get some more speed on the base paths. Stealing or even just the threat to steal adds an extra dimension to the game. It keeps the opposition's infield and pitching staff off balance and always wondering what could happen next. LaRussa and company need to look at the stats you've given and take a little good advice. Great post! Not only does it keep the pitching staff off balance, but it also helps the Cardinal hitters. With the threat of a stolen base in the mind of the pitcher, he is more likely to make a mistake to the hitter which would open up a bunch of positive offensive situations. Great post! The reason the Cards had so many steals under Herzog is because he didn't have any sluggers. I'd be interested to know how many home runs we had in eighties compared to the present? If I had to decide which is more exciting to watch or even draws more to the stadium (and let's face it, is what really drives the deciscions of the owners), I'd have to say the long ball. So if Larussa has to "manufacture" runs using his power jitters instead of stealing bases, so be it. I'll take homers any day.